A late penalty miss denied Benington victory at Billinghay Athletic in the Taylors Garages Premier Division. In a game dominated by a difficult strong wind, Tom Baxter’s 85th-minute spot-kick was saved by home keeper Phil Soltys and the visitors had to be content with a share of the spoils in a 1-1 draw. Matthew Hood had opened the scoring for Benington. There was another 1-1 draw, this time at Skegness Town Reserves where Coningsby were the visitors. Kirton Town endured a disappointing second-half performance as they went down 3-1 at home to Fishtoft. Neil Allen had given Fishtoft the lead with a fine shot on the turn before Town levelled with anexcellent equaliser on the counter-attack. Things went badly wrong for the home side early in the second half when Ryan Mason capitalised on a mis-hit clearance from the Kirton keeper and Allen added a third. Old Leake’s strike duo of Adam Tempest and Scott Mackay put Ruskington Rovers to the sword in their home encounter in very windy conditions. Both players claimed hat-tricks as Leake ran out 7-1 winners. James Leafe added to the scorline while Nathan Phillips hit a consolation. In the Taylors Ford Division Two, two goals from striker James Todd helped Coningsby Reserves to a 3-1 home win against Kirton Town Reserves. Sean Taylor hit the other Coningsby goal. Daniel Long also hit two goals for Pointon Reserves in their 3-1 home win against basement side Mareham United. Jason Chilvers was also on target for Pointon. Park United got off to a storming start at Fishtoft Reserves with two goals inside the opening 20 minutes when Alex and Tom Limb were both on target. Those early goals proved to be enough for the visitors and they held onto the three points in a 2-0 scoreline. In the Taylors Vauxhall Division Three, Jay Adams grabbed a hat-trick for Spilsby Town Reserves in their 4-1 home win against Friskney Reserves. The other Town goal came from Dan Smith. Old Doningtonians Reservers travelled to Spalding Harriers only, coming from 1-0 down to win courtesy of goals from father and son Andy and Luke Barnett. 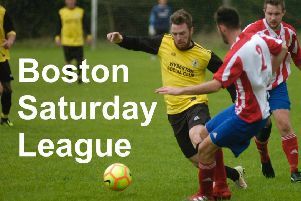 Leverton Reserves started the stronger away at Benington Reserves as both sides battled away in the stormy conditions. Leverton opened the scoring through Deividas Urbsys and they extended their lead with a slick move which was finished off in style by Sam Bird. Benington pushed forward after the break in an attempt to get back into the game and they were rewarded with a penalty which Stef Furnell tucked away. Leverton suffered a double body blow in the penalty incident when their goalkeeper Dec Read was dismissed in an ensuing scuffle. In the Target Newspapers Challenge Cup, Friskney were made to fight for their passage through to the third round when the Division One outfit squeezed out FC Hammers 3-2. Chris Harker, Jed Stainton and Victor Sibert hit the Friskney goals. Fellow third division underdogs Pointon A put up a tremendous fight at Division One leaders Boston College before bowing out by the same 3-2 scoreline. Woodhall Spa United were holding FC Wrangle at half-time with the scores standing at 2-2 - before Wrangle were reduced to 10 men. But it was Wrangle who progressed 5-2. Nicky Frost (two) and Luke Wilson completed Railway Athletic’s comeback after goals from Chris Wing and and own goal had seen the Dons lead 2-0. Jon Hardy hit a hat-trick for Freiston in their 7-3 home win against Boston Titans. Perrie Dale(two), Ty Fravigar and Reece Lovelace also netted. Matt Howden hit all three of The Titans’ goals. Leverton Sheepgate FC were left without a game after Sibsey could not raise a side.